SUMMARY: Three land use scenarios for the year 2040 were evaluated by the Lee County (FL) Metropolitan Planning Organization for their potential to reduce trip lengths and increase transit viability. In June 2014, the MPO selected a preferred scenario as the basis for the upcoming long-range transportation plan. Spikowski Planning and Criterion Planners worked with Jacobs Engineering and city/county planners to formulate and analyze the scenarios. OVERVIEW: The Lee County Metropolitan Planning Organization (MPO) has completed an intensive effort to explore alternative ways the county could grow in order to reduce vehicle trips and increase travel options. Identifying future land use patterns as alternative scenarios has allowed the MPO and citizens of Lee County to evaluate the costs and benefits of different patterns. 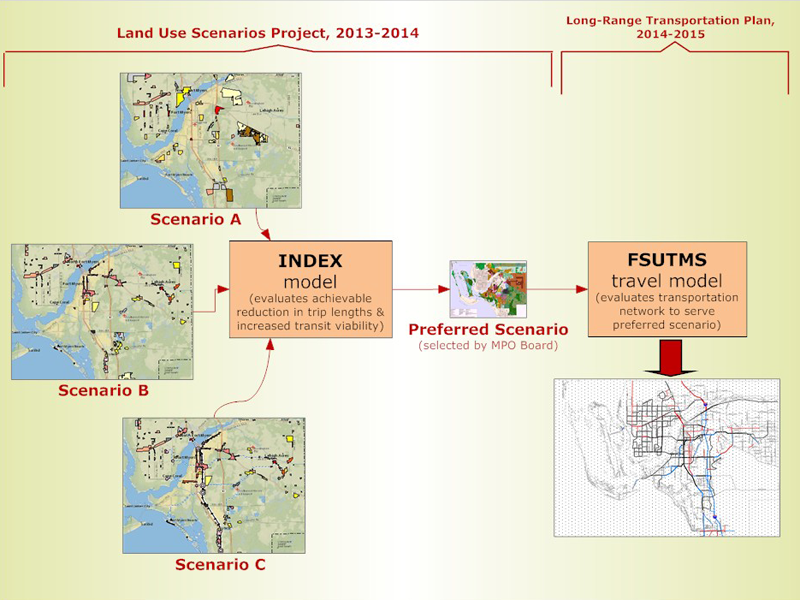 In June 2014, the MPO Board selected Scenario C, which will become the basis of the future transportation vision in the MPO’s forthcoming 2040 Long Range Transportation Plan (LRTP), which must be adopted by December 2015. Understanding the potential locations of future concentrations of housing and jobs helped create the alternative scenarios. Much of the analysis has been completed using the INDEX land use model which has an integrated database that can assess key indicators such as vehicle miles traveled, densities, and energy consumption. All the local government staffs in Lee County were involved throughout the process of formulating alternative growth scenarios to incorporate the latest local planning efforts. Coordination among stakeholders, local agencies, the general public, the MPO Committees, and the MPO Board has occured throughout scenario development, comparison of alternatives, and selection of the preferred scenario. This has included presentation of documents, policy assumptions, and future projections. The selected scenario will be used in a computer model that will simulate travel patterns across twelve southwest Florida counties at a specific stage of development, defined as the population level projected for each county for the year 2040. Scale the level of development (population and employment) back from build-out levels to anticipated 2040 levels. 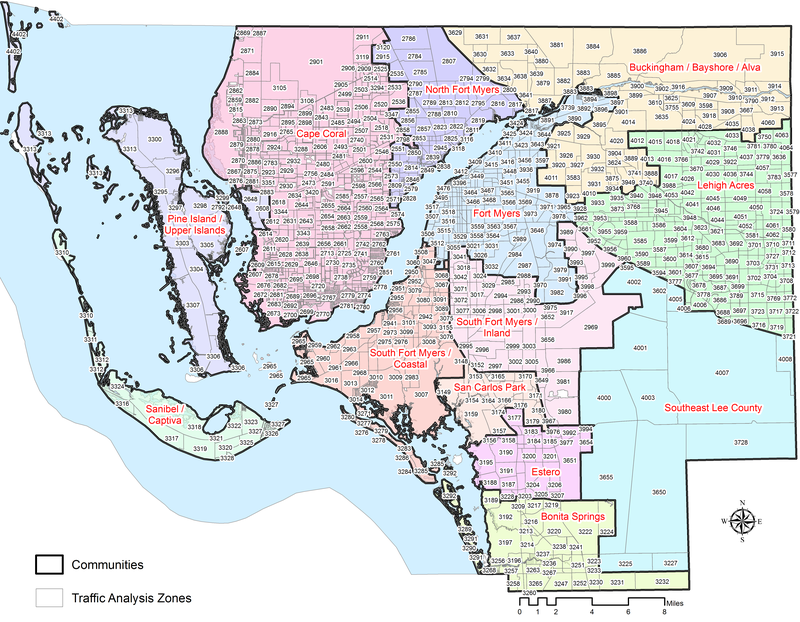 The travel model divides Lee County in “traffic analysis zones” (TAZ). The raw data from Scenario C was converted for all 1,434 TAZs. These zones have been grouped into 13 community areas so that development patterns and anticipated growth can be assessed at sub-county levels. The map below shows the 13 communities and TAZ outlines. The MPO retained Jacobs Engineering Group to coordinate this effort. Jacobs was assisted by Spikowski Planning Associates and Criterion Planners.